Join us at the Abandoned Newsham Park Hospital and Orphanage in Liverpool Merseyside - this is the night you have all been waiting for! 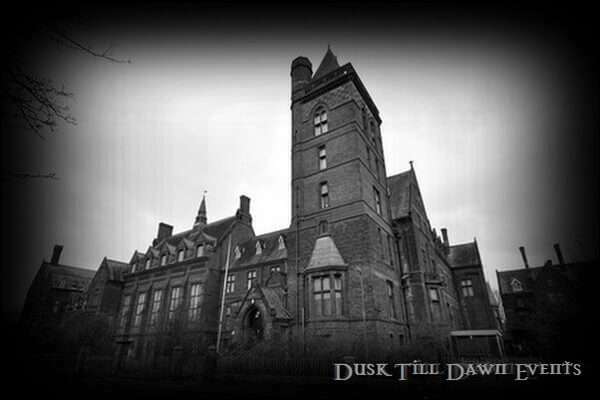 Dusk Till Dawn Events invites you to spend the night ghost hunting at this extreme and terrifying location. Now derelict this locations historical background is that of an Orphanage, a Hospital and in later life an Old Person’s Nursing Home. This building is massive in size with so many spooky Corridors, Dens and Rooms to get lost in. On the upper floors of the building the old Hospital Wards can be found along with a Bell Tower, Chapel, eerie Staircase’s and the all time ultimate; the Mortuary with fridges still intact! This building has lain dormant and desolate for many years and much of the paranormal activity that is said to have occurred has been reported by security staff whilst patrolling the location. Strangely Workmen have also reported that tools that they had been using; were moved without explanation only to find them in other parts of the building. The Abandoned Newsham Park Hospital and Orphanage has an intense and foreboding atmosphere which hits you upon entering the venue; we know that you will not want to miss the opportunity to investigate this amazing horror movie style location. If you choose the non-refundable deposit option, the final payment for this event will be required no later than the 17th July 2019. *If paying by Deposit please note the final payment for this event will be required no later than the 17th July 2019.